Maa Tarini is one of the embodiments of Shakti and is one of the chief presiding Goddesses in Odia culture. 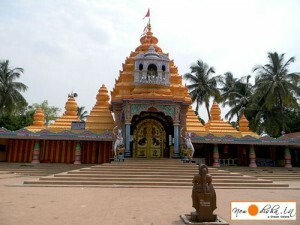 Her chief shrine is in Ghatagaon, Keonjhar District, Odisha. Maa Tarini is the presiding deity for all Shakti and Tantra peeths or shrines in Odisha. The origin of Shakti or worship of the Earth as a female embodiment of power is found across many cultures all over the world. In Odisha which has a high density of tribal population whose religious practices have been assimilated into the mainstream Hindu faith, the worship of natural formations such as rocks, tree trunks, rivers is widespread among the tribes. Maa Tarini is always depicted as a red face with two large eyes and a mark in the middle which serves as an indication for a nose and also a tilak. This primitive conception is symbolic of the simplicity of tribal beliefs and ceremonies. The red colour has been attributed to dyes made out of iron ores or ocher which are quite plentiful in the state and would thus have been used by the tribes for anointing and decorating the sacred figures of worship. The ornate letters in the background mean “Maa” or Mother in the Oriya language. They were a much later addition although the Oriya script did change very slightly over the millennia. In this form she is very similar to the conception of the Goddess Kali at Kalighat. Although the two are embodiments of the same divinity, Kali is the Goddess of death and destruction whereas Maa Tarini is the force of life. Interestingly, two of the names of Kali are Maa Tara and Maa Tarini. The famous Hill Shrine of Maa Tara Tarini the breast shrine of adi Shakti in Ganjam district of Odisha represents the force of Both Kali and Tarini and known as Maa Tara Tarini. Near about 1475 A.D. King Purusottam Dev ruled Kalinga. Once on a trip to South India he chanced upon Princess Padmavati of Kanchi and proposed marriage. The proposal was accepted and the minister of the king of Kanchi traveled to Puri to finalise the arrangements. The Rath Yatra was in full swing and he saw the king sweeping the chariots of the deities. Marriage to a sweeper was unacceptable and hence the marriage was called off. Insulted, the King of Puri declared war on Kanchi. He was defeated in the first war. He prayed to Lord Jagannath and it is believed that he was directed to appoint one Govinda Bhanja as his Senapati or General of his army. Bhanja was in fact the son of the king of Keonjhar and was staying in Puri because of differences with his father. Under the command of Bhanja, the army marched towards Kanchi. In the forests near Vijayanagar, the horse of Bhanja refused to move any further. Whatever may be the real reason it is here that Bhanja and thus Hindu society as a whole was introduced to Maa Tarini and she was admitted into the Pantheon. Give Responses for "Maa Tarini Temple, Ghatagaon of Keonjhar"